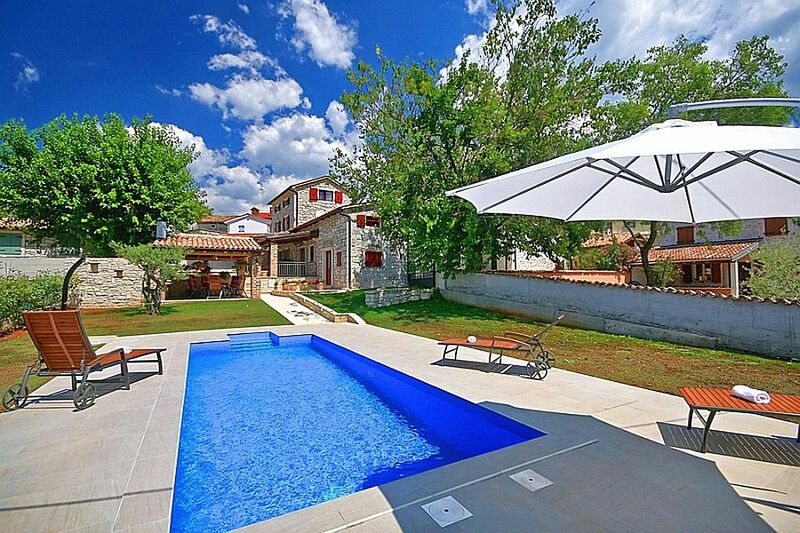 This renovated Istrian stone house is located in the village Dračevac, 9 km from Porec and its beaches. The house was built by the end of the 19th century, completely renovated in 2013 and furnished with a combination of modern and rustic furniture. Located on its own private ground of 1500 sqm, the house offers its guests an outdoor pool with outdoor shower and grill, spacious covered terrace with sitting set and private parking. House for 6-8 persons of 115 sqm consists of the ground floor with a kitchen, dining room, bathroom, and living room with two persons sleeping couch, satellite TV and fireplace – from the kitchen and the living room it is possible to access a covered terrace with sitting furniture and barbecue, one more double bedroom (locatet at the open loft) with shower/toilet at the ground floor, with entrance from the terrace. At the first floor there's a double bedroom with french bed and shower/toilet, while on the second floor (attic) is another double room with a french bed and a bathroom/toilet with whirlpool bath. Es waren wundervolle 4 Wochen und wir haben uns sehr wohl gefühlt! Das gesamte Anwesend ist eingezäunt und so gab es auch keine Probleme mit unserem Hund. Vielen Dank an die Hausbesitzer!